Unless you’re from Lincolnshire then the chances are you’ve never heard of stuffed chine. I was introduced to it last year by Maureen Dennis who, along with her friend Bridget, travel from Lincolnshire to Melton Mowbray every week with their fantastic homegrown vegetables, pastries and preserved goods to sell at the Sunday Market. Maureen is incredibly proud of Lincolnshire’s food heritage and one day she brought along some slices of her homemade stuffed chine for me to try. I immediately fell in love with it. 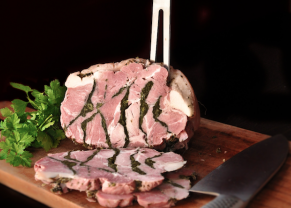 Unique to Lincolnshire, stuffed chine is a traditional dish made with cured pork and parsley. Once a county staple, its popularity has declined over the years as the younger generation looks to more modern cuisine and the older cuts are slowly forgotten. In the days before fridges and freezers, families would cure their meat to last them through the lean winter months. Each family would have a couple of pigs to kill – some of the meat would be salted and hung, and the rest used fresh. Communities were tightly knit and there was often a friendly agreement between neighbours to stagger their kills and share fresh meat among the families, who then reciprocated when they in turn killed their pigs. Neighbours would pass on and receive this “pig cheer” all through the winter months while the pig killing went on, thus ensuring they always had fresh meat. Once spring approached, however, they would look to use up some of the meat that had been salted and put away. Stuffed chine was traditionally served when the May Hiring Fair was in town (a kind of outdoor employment exchange, where people made themselves available for temporary work), and the largest chine was usually saved for Christenings – seeing a fresh row of parsley growing in a garden was often the sign that there was a baby on the way! When the time came to use the chine it was soaked in cold water overnight, then carefully sliced from the spinal side towards the rind. Finely chopped parsley was packed tightly into the deep pockets in the flesh, then the joint was turned over and the process repeated on the other side. Next, the chine was very tightly wrapped up in muslin or an old pillowcase and simmered until cooked through. The cooked meat was left to cool still wrapped in cloth in order for it to set. Once completely cooled it was unwrapped, sliced thinly and served with a sprinkle of vinegar to cut through the fat. 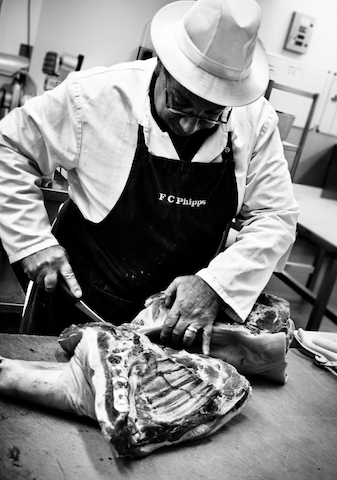 Few butchers still use this traditional method as the cooked chine has to be carefully sliced by hand to avoid the bones, which due to the large bone-to-meat ratio makes it quite an expensive cut. For this reason many butchers choose to use collar bacon instead, which contains no bone and can therefore be sliced by a machine. 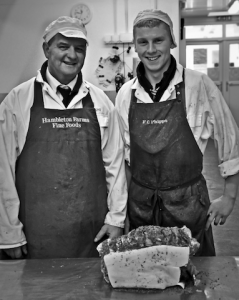 I visited Hambleton Farms’ butchery in Mareham-le-Fen, Lincolnshire, where they still make stuffed chine in the traditional way. Neck chine is a cut taken from between the shoulders that includes the muscles either side of the spine. This is removed and cured for three weeks using Hambletons’ secret recipe. 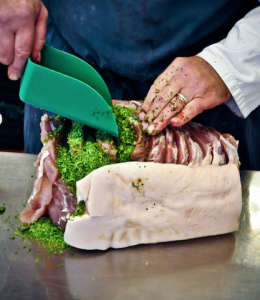 Once the joint is cured, it’s sliced, stuffed full of dried parsley and vacuum-packed before being very gently steam-cooked for several hours. Once cooled the stuffed chine is unwrapped, ready to be sliced. The French poet Paul-Marie Verlaine spent a year as a schoolmaster just north of Boston, Lincolnshire, in the mid-1870s and it is said that he became enamoured with this Lincolnshire delicacy. Verlaine continued to search for stuffed chine as he journeyed around Britain, but as is still the case today, he failed to find it outside Lincolnshire. 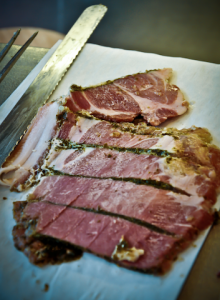 There is something rather beautiful about the strips of pink salty pork divided by the flashes of punchy green parsley that immediately draws you in when you see it standing proudly in the butcher’s shop. I for one certainly hope to see it there for many years to come. is paramount, and you will need lots of it. 1 Put your collar rind-side down on your cutting board, then very carefully make five deep cuts down towards the fat, taking care not to cut through it. Each cut should be about an inch from the next. 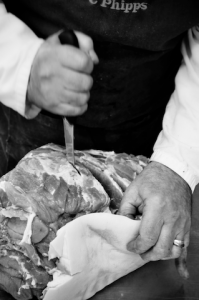 2 Stuff each cut full of your parsley then, using butchers’ string, tie the joint up tightly and wrap in muslin. 3 Bring a large pot of water to the boil, thenpop in your bacon and simmer gently for about an hour and a half. 4 Once cooked, remove the bacon parcel and leave, still wrapped, to cool completely so that it sets. Once cold you can unwrap and slice thinly. We ate ours the following day with boiled new potatoes, a dash of vinegar and parsley sauce, and have since polished off the rest in sandwiches – delicious!